STROUDSBURG, Pa. -- Four men facing the most serious charges in a brutal fraternity hazing ritual that resulted in the 2013 death of a New York City college student pleaded guilty Monday to voluntary manslaughter. 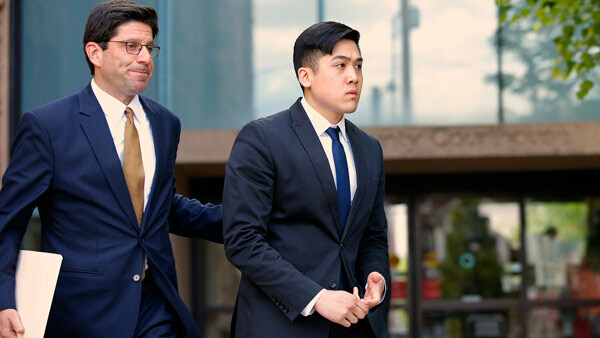 Fraternity members at Pi Delta Psi admitted they physically abused Chun "Michael" Deng, a Baruch College student, then tried to cover it up as the 19-year-old lay dying in their rented house in Pennsylvania's Pocono Mountains, about 100 miles west of New York. Defense attorneys had called Deng's death a fraternity prank gone horribly awry. The four defendants, Kenny Kwan, Charles Lai, Raymond Lam and Sheldon Wong, had been charged with third-degree murder, but pleaded guilty to felony manslaughter and hindering apprehension charges. They face 22 to 36 months in prison when they are sentenced in December. The former fraternity brothers, now in their mid- to late 20s, were stoic in court and said nothing to reporters. Their lawyers didn't comment. Police have said fraternity members blindfolded Deng, forced him to wear a heavy backpack and then repeatedly tackled him during the hazing ritual, known as glass ceiling. Deng cursed and hit Lam at one point during the ritual, Monroe County Assistant District Attorney Kim Metzger told the judge. She said Kwan was the last brother to tackle Deng. "Mr. Deng did not stand up after that moment," Metzger said. Deng fell unconscious and was carried inside the house while fraternity members changed his clothes and searched online for information about his symptoms, waiting an hour before taking him to the hospital, according to court documents. Deng, who suffered a brain injury, died a day later. Wong did not participate in the hazing but helped organize it as "pledge educator," Metzger said. Deng was the last of several pledges to be hazed that weekend. Another suspect has pleaded guilty to hindering apprehension and was sentenced to probation. The fraternity itself was charged with murder, and dozens of other suspects face less serious charges.